Here's your chance to SAVE over 75% on Golf! The Kearney Hub Golf Card lets you do just that! Buy one for yourself, your spouse, your dad, ANYONE! 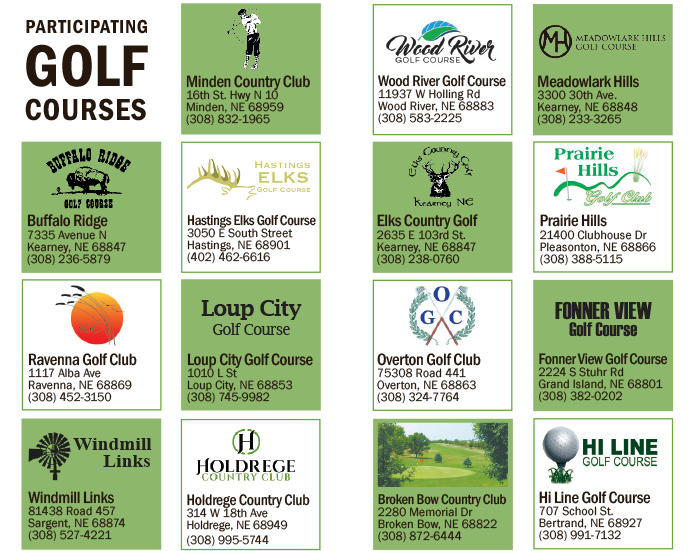 One card gets you one round of FREE golf at each of the courses listed. See full details below. If you purchase the golf card here at bigdealskearney.com we will mail you your card within 3 business days. Golf cards can also be purchased at the Kearney Hub office. Thank you for using Kearney Hub - Big Deals Kearney site.